As part of our occasional series of articles on land sightings of Nessie, we come to what may be the most unusual case of all. In fact, on first inspection one may wonder what this has to do with the Loch Ness Monster at all. But it is a story where one may walk away thinking it either has nothing to do with the Loch Ness Monster or it has everything to do with the Loch Ness Monster. The picture below sums up the problem. This strange tale is told by the witness, Lieutenant McP Fordyce, as he related it to The Scots Magazine back in June 1990. This account took place a year before the Loch Ness Monster first began to appear in newspapers. In April l932 while living in Kent, my ﬁancee and l travelled to Aberdeen to attend a family wedding. At the conclusion of the function, rather than return south straight way, I decided to show her a little of my native land. We cut across to Inverness where preparations appeared to be in full swing for a Highland Gathering. After dinner in the late evening we took a stroll through the the town. and saw men in shop doorways and at street corners practising on their bagpipes. The air was full of sublime music (my version), rent with strange, wild sounds (her description although she never expressed it at the time!). The following morning we set off on our journey back to England. The weather was fine, a beautiful spring day, and we had a lovely run by the side of Loch Ness as far as Foyers where we spent a short while admiring the famous waterfall. Shortly after leaving Foyers, the road to Fort William turns away from the lochside and runs through well-wooded country with the ground falling slightly towards the loch. Travelling at about 25 mph in this wooded section, we were startled to see an enormous animal coming out of the woods on our left and making its way over the road about 150 yards ahead of us towards the loch. It had the gait of an elephant, but looked like a cross between a very large horse and a camel, with a hump on its back and a small head on a long neck. I stopped the car and followed the creature on foot for a short distance. From the rear it looked grey and shaggy. Its long, thin neck gave it the appearance of an elephant with its trunk raised. Unfortunately. I had left my camera in the car, but in any case I quickly thought discretion the better part of valour and returned to the vehicle. This strange animal occupied our thoughts and conversation for many, many miles and we came to the conclusion that it was an escaped freak from a menagerie or zoo. We felt that a beast of such tremendous proportions would soon be tracked down and captured. Apart from scanning the national papers for some time in search of mention of the creature, we let the matter rest. I told other members of my family what we had seen and they urged me to publish the story, but I have not done so until now. At the time of the sighting we were quite unaware of there being anything strange in Loch Ness, but in the autumn of that year, stories started appearing the Press of an unusual animal being seen in and around the loch. It was the spring of 1933 that the term “Loch Ness Monster" came into general use. Lt. Fordyce (pictured below) then explains how he eventually sent his account to the magazine editor and his own theories concerning the beast. The question the article itself raised was "Shouldn't the Loch Ness Monster look like the creature below" to which it helpfully provides the reader with a populist picture of Nessie (below). Well, I guess the monster should look more like the second picture than the first, but when I first read this account my initial reaction was "statistical outlier". Consider a mathematician plotting a set of measurements on a graph. The points will tend to cluster around a point, line or curve and some deductions can be made based on that. However, it may be that for some reason one data point is way out of line and is ignored in the final assessment. That is, you don't draw your curve to take a detour round this one point. However, Lt. Fordyce is a person and not a statistic! Looking more closely at the account, I had two guesses at the witness location based on Fordyce's statement that the animal was 150 yards ahead having entered well-wooded area beyond Foyers. These are shown below marked "A" and "B". I have driven through this forest many a time and it is quite a winding road and so 150 yard stretches are not frequent. Note however that the creature would have a mile walk as the crow flies back to the loch - and that across some hilly terrain! If it followed the river, it was even further and it is not clear to me whether it would have had to negotiate the waterfall at Foyers. Deer are a common sight wandering across the road and I have seen them myself. It is highly unlikely deer could be mistaken for what Lt. Fordyce described. I did wonder if he had seen an escaped dromedary camel from one of the circuses that were visitors to Inverness in olden days. 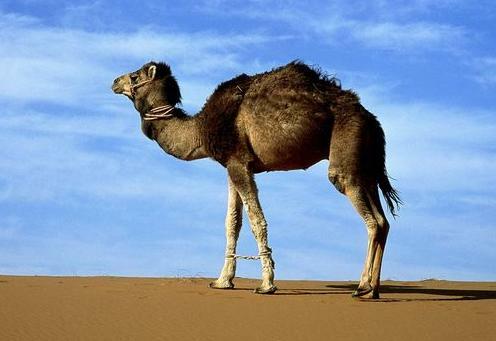 The lieutenant described it as grey and indeed you can get a grey looking camel (below). However, a scan of the Highland newspapers of the time on the Ambaile Highland Heritage website carries no stories about escaped camels though it is not inconceivable that there was some exotic pet owner frequenting the area (it was reputed that somebody kept crocodiles near Loch Ness in the 1930s!). It is clear however from the account that Lt. Fordyce knew what a camel looked like. So what did the lieutenant and his fiancee see in those pre-Nessie days? Lt. Fordyce offers the opinion that Nessie is an amphibian and that monster hunters should turn their attention to the Monadhliath mountains in the pursuit of the creature. Amphibious theories are not new to the Loch Ness Monster debate, but the assumption behind these views is that though the monster can take to land, this is the exception rather than the rule. Lt. Fordyce seems to be reversing the land-water priority here. Now as far as I know, Lt. Fordyce is the only person I have read who has espoused this unique view of the Loch Ness Monster. But, for the sake of argument, let us speculate upon such a land-based creature. One argument against this theory is that the monster has been reported multiple times as having flipper type appendages which clearly points to an aquatic based animal. However, the waters are somewhat muddied by other reports which report short, squat like legs with an occasional reference to hoof like extremities. I have my own explanation for that which will features in a general article on Nessie morphology at a later time, but this sighting with its longer legs could not be so explained. In fact, one other account does mention somewhat long legs and that is the MacGruer land sighting from around the time of the First World War. Such a description has been put down to the person being an unreliable child witness, but should we be so dismissive in the light of the Fordyce case? However, at one level, a land-based creature which makes the odd forage into the loch would explain the relative rarity of sightings as it would transpire that it actually spends most of its time on land! But the flip side of this argument would then ask why this creature has not been spotted in the Monadhliath mountains? The area itself is a pretty bleak mountain range extending east from Loch Ness for about 20 miles to Newtonmore and extending approximately north and south for a greater distance. It's heights can be covered in snow for long periods. However, the range hosts four munros (mountains over 3,000 feet high) which would prove an attraction to summer hillwalkers and there will be some walking routes at its fringes such as near the town of Newtonmore. There may also be some deer stalking going on at various times as well. However, by and large it is a wilderness that is not frequented by man and it is possible for a creature of such a size to stay mainly hidden. Nevertheless, one would expect something to have been seen over the last 100 years or more, even if such a beast could be mistaken for deer at longer distances. So far, I have come across only two such stories of strange beasts walking those barren hills. 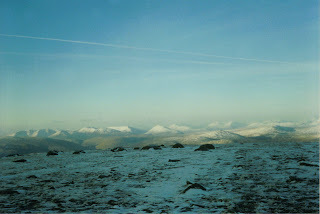 The first is the famed Fear Liath Mor in the old Gaelic or the Big Grey Man of Ben MacDhui. Like our Fordyce report, it is reputed to be a large, dark and hairy creature that stalks walkers on Scotland's second highest mountain. Unlike our hairy Nessie, it is also reputed to be humanoid in shape. However, Ben MacDhui is not quite in the Monadhliath mountains being slightly further east. You can read more about the Big Grey Man here, but suffice to say it does not quite sound like what we are looking for. 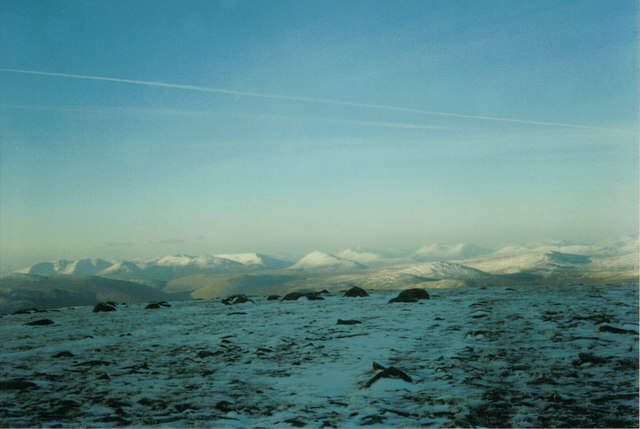 The Slochd Pass is still known today and is at the north east extremity of the Monadhliath mountains near the modern A9 road to Inverness. So, one may argue that ancient and modern lore meet in MacGregor and Fordyce's account of a creature both at home on land and in water. But I evade the ultimate question, how can we account for this sighting? Do we take the easy route of the sceptic and just say he saw a deer in a heat haze? That is so easy and tempting to say. Or do we suggest the account was misremembered after 58 years and was more Nessie-like than he suggests? But then again, who is to say he did not write down the account at the time for future reference? Perhaps the artist's impression was off the mark? I would love to see the actual basic drawing that Fordyce submitted to the staff artist. Indeed, Fordyce mentions an article on land sightings he had read in the past and states that his sighting was "very similar" to some of them. That article mentioned a range of classic land sightings, so one wonders how diverse Fordyce's sighting really was? In the end, I can't say. To suggest there is another strange species of creature in the area stretches even my credulity but to go to the other extreme and offer half-baked fob-offs is not much better. One thing is for sure, if Lt. Fordyce really did see what he described, it turns the biology of the Loch Ness Monster on its head. I recall once, back in the 90s, walking in the hills west of Newtonmore. When I was up on a summit plateau I noticed what looked like a large biped pogoing in the mist. Probably just a small sparrow enjoying the benefit of optical illusion. Nothing to do with Loch Ness, but a tale to tell. Not sure about the main thrust of the article. If this camel thingie had been making excursions on a regular basis then there's a good chance that it could have expired on land [ multiply 12,000 years by 0.05] or been nailed by the Picts / Gaels / Redcoats / Tourist Board. (There may be a reason why the Picts have a "swimming elephant" on their symbol stones rather than a "mountaineering camel".) And how might this slow mover have got on against the bears and packs of wolves which once roamed the area? On the other hand, there's a supposed [and apparently nonsensical] reference from 1520 about the last dragon in Scotland being slain, unlike "the monster of Loch Ness lately seen". But what if they were one and the same, just in different environments? This is a strange sighting. Lt. Fordyce stated that the animal he and his fiancée saw was enormous and had the gait of an elephant but also looked like a cross between a very large horse and a camel. There is no mention of long thin legs in his report so perhaps the artists impression is inaccurate in this respect. To have the gait of an elephant surely the animal would have thick and robust legs and these would also be necessary to support the weight of such a large animal on land. I was wondering if there were any other versions of the Lt. Fordyce sighting, or if it was just a case of the artist applying slimmer legs to the animal because of the alleged similarity to a horse/camel type of creature. When looking at the picture, if one can imagine the animal with thicker legs, it does seem a little more plausible, well to me it does. I completely agree, Pete; the long legs issue has always struck me as being anomalous and the result of mis-communication. The illustrator evidently heard the word 'camel' and engaged his creative licence, I'm just surprised he didn't draw in Oor Wullie in a Bedouin outfit riding on the creature's back. Also, I too am in a quandary about the flippers / stumpy legs dilemma; what about legs in front and flippers behind, or would the animal be able to travel like some pinnipeds, walking on it's wrists or knuckles, with the flippers in the lateral plane? Hi CS. Yes, we have the enigma of the flippers, legs or limbs with sparse and varying information concerning them. One thing that I am pretty certain about is that whatever the physiology of the limbs is, they would be more suited to aquatic use but still of some use on dry land, albeit fairly limited. I have not heard of any reports of Nessies running on land but there has been mention of hurried movement back towards the safety of the loch. In comparison an alligator, for example, can run at speeds of up to 12 mph and when this happens you know that the animal is running and not struggling to move speedily. This may not sound very fast but it is nearly half as fast as Usain Bolt runs in the 100M sprint. Thankfully, the alligator can't keep this speed up for too long but my point is that it is more than capable of swift movement as it has four legs that are at home in or out of the water and not really better suited to one environment. However, when in the water it has the advantage of a very powerful tail to help it along. One problem with us humans is that we've been re-arranging the placement of fauna and flora for thousands of years, moving all manner of specimens from continent to continent from the moment seafaring began. Usually with disastrous consequences for the indigenous species, but sometimes and more luckily with merely hilarious effect. Has there EVER been a single elephant, camel, or crocodile loose in Scotland for a short period of time? We can say "yes" with almost absolute certainty, because we know how we ourselves behave! Zoo animals, circus animals, lab animals and exotic pets will always get away at some point, because we their keepers are, after all, only fallible humans. To paraphrase Freud, sometimes a camel is only a camel. Unfortunate for anyone investigating Loch Ness, that one should wander nearby to confusticate the monster hunters, but probably not as unfortunate as it was for the poor camel. I'll be honest, I'm getting more interested in the high strangeness incidents at Loch Ness now more than the more mundane reports. I hope we see more articles here like this one. Ah, but what do we do with these high strangeness reports? Maybe gather the high strangeness reports together and compare them to each other instead of to the more typical reports? Given that this gentleman went on to be made a Deputy Lieutenant of London I would firstly assume he is a trustworthy person, although the accuracy of his observations will depend on the viewing conditions. He described an animal the size of a large horse with a hump on its back. So could it have been a large horse with a deer saddle carrying something, perhaps a deer, covered with material to disguise the nature of the cargo from the prying eyes of keeper and constable? Upon hearing the approaching car Wee Jock tried to get the horse off the road but as he was struggling up the bank he slipped and lost the lead rope and could only crouch aghast in the soft moss as the horse calmly walked across the road and into the wood on the other side to get away from the motor car. Is that fob-off sufficiently baked ? Somehow I fear it is not. "followed the animal on foot for a short while..."
By the way, the Grey Man of Ben MacDhui is regarded among educated people as an example of the atmospheric phenomenon known as a "Brocken spectre", entirely unrelated to water horses. Well, why shouldn't one make that assumption - unless other purposes are paramount? I am aware of the brocken spectre effect, and had already dismissed the grey man as anything to do with this case. Depending on your point of view, you might say that there will soon be evidence of monsters in the Monadhliath Mountains. Anyway, plenty of opportunities for camel-chasing. I must admit as I scrolled down to the photo I let out a laugh, but then composed myself and did read the article. I can't help but recall a recent case in the U.S. whereby several citizens reported seeing an African Lion, which turned out to be a dog (not an especially large one) groomed to look somewhat like a male lion, mane and all. I believe in the U.K. there was a similar case last year, which in all likelihood was a locally known oversized cat. So if dogs and cats can be mistaken for lions, then perhaps Mr. Fordyce can be forgiven for ... whatever he thinks he saw. Either that, or Tim Dinsdale was looking in the wrong direction all those years, he need to pick up his chair and turn it in the other direction. Yes I am assuming that Lt. Fordyce was close enough to view the animal with some clarity as he was sure that what he saw was very unusual. I don't think that he would have thought this if his was view unclear and too distant to make any reasonable observations. He also said that their sighting occupied their thoughts for many miles on their journey home. Indeed, it occupied his thoughts for a hell of a lot longer as he felt the need to reveal his experience some 58 years later. However, what effect this timespan had on the accuracy of his memories is another question but this can be applied to many witness accounts. He initially saw the animal from 150 yards. His initial speed was 25mph or 12 yards per second. Deduct more yards for reaction time and braking time plus his pursuit of the creature on foot and I would say he got as pretty close as he was comfortable with. A pinch of salt is required with this old kipper of a tale. Fordyce is rather coy in telling us he had no idea [ in 1932 ] that the loch might be the home of fabulous beasts, but he kept quiet about it all the way through the Nessie Glory years of 1933/4 abd waited till 1990 to tell his story, after 50 odd years you'd think he'd come up with a better yarn than that. All the land sightings are pure fiction, even the Great Finlay one, not one stands up to any serious scrutiny. He may not have kept quiet. He may have tried to have his account publicised at the time via a letter but with the prevaling wind being very much in the direction of plesiosaurs, he may have got short shrift from editors. I will continue to hold that the beast has been seen on land multiple times. (Greta Finlay's sighting was in water). "He may not have kept quiet. He may have tried to have his account publicised at the time via a letter but with the prevaling wind being very much in the direction of plesiosaurs, he may have got short shrift from editors." Lieutenant-Colonel Fordyce answered that question in his piece to "The Scots Magazine". He wrote "Some readers may wonder why it has taken almost 60 years to put in print what we saw in 1932. There are several reasons: the first is that I have never been in the habit of writing to the press on any subject: the second is that sceptics at that time would have dismissed the story as a hoax or an absurdity. (etc)"
Thanks, unfortunately for Lt. Fordyce, he would have found the corpus of sceptics even less receptive 60 years later!
" ...he would have found the corpus of sceptics even less receptive 60 years later!" That is not consistent with my position at all. In so many of these cases of anomalous and almost unique observations I have used local knowledge to suggest reasonable explanations that did not occur to the observers at the time, and for obvious reasons were not newsworthy later. This is a far cry from claiming a hoax or an absurdity, except of course when that is admitted afterwards. Sometimes there are several plausible explanations and then you accuse me "strafing". If there really were 20 ft monsters flopping out of the loch and onto the roads I think there would be thousands of local people contributing to your blog in an attempt to solve the mystery. Where are they? You are entitled to "perpetuate the mystery", or rather to exhume it, but I suspect the people interested in gaining an understanding of unusual events at Loch Ness far outnumber the myth-huggers. Excursions out of the loch are extremely rare, so don't expect "thousands" to join the fray. In fact, from 1935 (excluding the spike years of 1933-1934), land sightings are reported once every six years! If by "reasonable explanations" you mean mistaking a common horse for a monster, that is not a reasonable explanation by any measure of common sense. You need to explain how something so instantly recognisable as a horse would fail to be so recognised. As for "exhume", when did this burial occur, who pronounced the monster dead, who conducted the funeral and who offically conferred the authority to such a coroner and undertaker to perform such actions? The late Robert Rines proposed that maybe the LNM or their species may be dead, possibly because of pollution of the modern world but I wouldn't call it an official act of any type. Nobody can prove that unusual animals don't exist in the loch or even lochs of Scotland but that doesn't seem to prevent some sceptics from ridiculing those of us who believe there may be something in those waters as I myself have found out. The vast majority of sceptics are not famous people in any way, they are our everyday buddies, many of which would think that we were barking mad for contemplating the possibility of such things and this is possibly why many more sightings go unreported in my opinion. I think that there is a strong possibility that Mr. Fordyce as he was known at the time, would have realised this even without knowing about the history of loch ness. I don't know if this is a similar sighting but in 1912 there was a reported land sighting by 5 or 6 children including a William MacGruer. He said it was a queer looking animal that moved to the loch and vanished in the water. Described as camel like with long neck and humped back . There are other old reports that say a "camel like" creature was seen.could it be that people had seen a camel at the circus and that is why they thought of the similarities or was it a camel? One of the problems is that eye witness testimony is unreliable in that 6 people can see the same thing and report it differently but should we then take this more seriously because of the similarities? Like any thing involving the past, we weren't there so can only speculate. Well, a camel does have more merit than weak arguments about horses. That implies an escaped animal from a travelling circus or a private menagerie. The problem is I have found no press reports aout such an animal yet. The MacGruer report has similarities except that "camel" went into the loch! At this website is a photo of a circus parade through Inverness in the 1890.s which had a troop of camels :.http://www.ambaile.org.uk/en/item/item_photograph.jsp?item_id=4714 so older people will have seen camels but whether one escaped ? there doesn’t seem to be any record of it. Yes, and a camel is even on the coat of arms of Inverness, so they were not unfamiliar creatures. Being objective about it, an eyewitness land sighting without corroborative evidence is neither better nor WORSE than an eyewitness surface sighting without corroborative evidence. Now the opportunity for physical evidence might seem higher with land sightings, and something would surely be amiss if there was no such evidence after hundreds of such cases, but we don't have hundreds, only a handful of such reports scattered over a long period. Now at least in the case of the Arthur Grant sighting (this according to Witchell) a Fellow of the Zoological Society (a Mr. H. F. Hay) inspected the site and found a definite trail through the bracken, and obtained measurements consistent with a large body having been 70 yards inland from the point Grant saw it enter the water. Weak evidence perhaps, but that's a notch up from no evidence. Interestingly enough Grant's sighting came the day after the British Museum announced the debunking of the Wetherall hoax. Now seriously, would anyone in their right mind attempt to launch a new hoax the day after that? Especially one as labor-intensive as faking a trail that far into the bracken? Would a zoologist go on record saying the trail was there, in light of all the derision floating around Wetherall at the time, unless he really believed that's what he'd found? This is a case where dismissing the sighting offhand would be unreasonable. Arthur Grant has been branded with the "guilt by association" scenario because Wetherell was involved with the post-sighting investigation. His alleged hoax phone call to the papers is also cited but these testimonies beloved of sceptics have no more corroboration than the sightings they reject. There is quite a lot to the Grant story which requires further study. "Camels might be known as ships of the desert but they had giant ancestors that once roamed the Arctic. Bone fragments belonging to a camel almost one-third larger than any now living have been recovered from a remote site in the far north of Canada. The animal lived 3.5 million years ago." smaller: long neck, humped-back and fairly long legs, sandy pale yellow color. from only a few yards distance. Sounds similar to what Fordyce saw 20 years later only larger! And on the same end of the Loch. Could he have hoaxed his sighting, having heard or read of the groups sighting? MacGruer, according to Mackal didn’t make his report until the time of Fordyce’s alleged sighting. Of course his ﬁancee would have to have been in on it. And why hoax? According to Fordyce, at the time, he was unaware of any strange creature in the Loch. And why would Fordyce wait 58 years to tell his story? It just doesn’t add up. I had forgotten about this account until rereading your article and reviewing Mackal’s book then making the connection. Tabitca above also makes mention of this 1912 incident from the same source no doubt. Excluding mistaken identity and hoaxing, if they really saw a flesh and blood animal, what was it? Could they both be cases of mistaken identity no matter how closely they agree? What are the odds? Clearly what both parties claim to have seen have no bases in fact to the LNM phenomenon as we understand it. I resist the urge to classify the incidents as paranormal in nature. But what other alternatives are there. The mythical water Kelpies? Queerer and queerer, stranger and stranger!